It’s so sweet to see names such as “Word Perfect”or “VisiCalc” Such names have the magical aura of products remembered from long ago, like “Bovril” or Cod Liver Oil. Crossing the Chasm is full of such names, even though the author Geoffrey Moore candidly admits that since the first publication in 1991, he attempted valiantly to substitute more recent company and product names when he came to revise it for a second edition. It is significant that he could do so without ruining the book, because the argument isn’t about what WordPerfect, or VisiCalc does; it’s about the position of high-tech tools in the market and how they are perceived. Moore was able to replace the examples, but in fact the originals would have been just fine, since the book is about the market. And everything he says about the high-tech market remains compellingly relevant. The technology adoption life-cycle (with the memorable acronym TALC), about which the whole book is based, is just as valid today as it was when the book was written over fifteen years ago. What is the secret of the book’s success? A very simple assessment of the technology market that seems a reasonable summary from experience. A simple set of recipes for growing a high-tech company. Plus, Mr Moore should be commended for including examples like Microsoft, which he candidly admits do not fit his model at all. The book is by no means perfect. There are many reasons why a company based on high-tech innovation may fail, frequently through no fault of the founders. One major factor rather downplayed by Moore is standardization. The adage is to follow the standard unless you are the market leader; the truth is rather more complex. There is a whole other story about standardization and the extent to which a company can follow it, or simply suggest that a standard exists. . The book does mention it to gain market advantage. There is mention of it with Oracle using SQL to gain market advantage, but the reality is somewhat more complicated, for example, MarkLogic using the phrase “NoSQL” as if it were a standard, as in “the NoSQL database”. Of course, the book predates the lean development movement, and some statements read rather strangely today. For example, in chapter 5, there is a description of the minimal product functionality, but also the maximum product functionality, which Moore describes as “Augmented product” (the maximum configuration to achieve the objective). One interesting by-product of the lean software development process is that the maximum configuration is never reached – and with good reason. Moreover, those old names that occur throughout the book – a couple more examples are “Lawson Software” and “PalmPilot” – do in the end strike a chill. 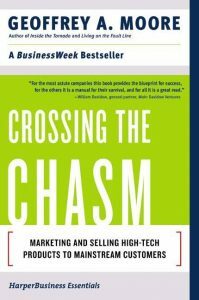 If Crossing the Chasm is about all those companies that successfully crossed the chasm into the mainstream, what became of them afterwards? Why are so many of them forgotten today? You can’t help noticing the bewildering pace of technology. Moore, who worked in high-tech marketing for 13 years, failed completely to envisage an “eBook” that held all the technical documentation for a Boeing plane – or better still simply called that information from a cloud-based repository. But to give the book its due, nobody reading it can I think not see the sense behind adapting the company marketing to fit the early adopters, or the late majority, or wherever in the technology life-cycle you may be. And as for memorable advice, “be a big fish in a small pond” – that’s the sort of message even I can remember. Crossing the Chasm is included here as a classic computing title because it is about the dissemination and marking of a technology-based organisation. It is difficult to imagine any technology startup based on software where there is no familiarity with this book’s title, if not all the contents. Are there good and bad metaphors?